Prayer is our position of dependence upon the Father and our recognition of God’s ability and power to help. Jesus teaches the disciples to pray with a focus towards His Kingdom. In addition, Jesus also teaches them to trust God for providing daily needs. And God does. He knows. He cares. He responds. “For some reason Kim [the Miller’s autistic daughter] has always woken up early, sometimes as early as four thirty. She knows she’s not supposed to get up so early, so she’ll go out in the hallway, flip on the light, and go back to bed. Five minutes later she’ll get up again, turn off the light, and go back to bed, only to repeat the process again and again. When Kim starts pacing on the third floor, Jill or I will tell her to get back in bed. Because we are separated by a floor, our telling sounds more like yelling… In the world of autism, Kim’s pacing is called perseverating. It got so bad that we consulted a neurologist, who suggested a drug, which we tried, but Kim just gained weight, so we stopped the drug and went back to yelling! 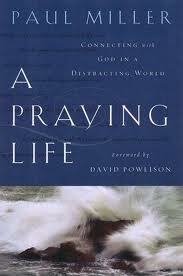 Prayer is God’s help to our helplessness. Christian maturity is not necessarily those who are strong and have life all figured out. Mature Christians are those who realize how weak they are and how strong and sufficient Christ is. Humility is the conduit for God’s grace and power to run through. Here are some helpful suggestions, adapted from Paul Miller (pp.46-51), for you to stay in loving dependence upon God each day. – Relationships require time. A fuller relationship with God happens because you make room for it. Efficiency, multitasking, and busyness all kill intimacy. Many of us remain on the surface with God or perhaps as theoretical business partners because we do not make time with God a priority. – Get to bed & Get out of bed. Your evenings will shape your mornings. Your mornings will shape your days. Discover your best time to spend with God and plan your schedule accordingly. And don’t plan to (only) pray in bed or the bulk of what God hears from you will be snores! – Get awake & Get alone. Regardless if it’s morning or night you may need help staying awake. Brew some coffee, take a shower, go for a walk… you know what keeps you awake. Then remove distractions (Matthew 6:5-8) and interruptions. It is difficult to be intimate when you are multitasking or being interrupted. – Get praying & Keep praying. Take baby steps (5-10min) and realize that praying is a process. Realize that consistency and quality is more important than length. Something else that may help is to pray out loud. Some of you may feel more comfortable praying silently but I believe (with Paul Miller) that voicing your prayers aloud confirms your intensity and intention with God. And, it’s not all together unlike the way the psalmist’s prayed (4:3, 5:3, 17:1, 28:2, 34:17, 55:1, 59:16, 69:13, 88:13, 116:1, 143:8). µ Repent of pride and averseness toward prayer in all things. God gives grace to the humble. Confess to God your dependence on Him. Pray about anxieties and those areas of life that you feel are uncontrollable and unchanging. µ Pray for someone else who is facing an anxious time in their life. µ Pray for our church worship services and ministries to be used of God for people to encounter the living Lord Jesus and to walk with Him in faith and obedience.